Wayne Gretzky has returned to the Edmonton Oilers organization. The organization named him as a partner and vice chairman of Oilers Entertainment Group. Gretzky and team owner Daryl Katz have apparently been talking about a return for a couple of years, as the NHL’s all-time leader in goals, assists and points says the timing is right to make an impact. The Oilers will open the 2016-2017 NHL regular season at Rogers Place Wednesday night against the Calgary Flames and the new arena has symbolized a new beginning of sorts for the franchise. They’ll take to the ice with a new captain in Connor McDavid and seem ready to commit fully to the youth movement. Gretzky’s part in the Oilers will be determined by Katz and Oilers Entertainment Group CEO Bob Nicholson. Gretzky has committed to serve as a sounding board for Chiarelli, but he doesn’t want to interfere. The plan is to spend more time in Edmonton in the near future, but he insisted that he’s not involved with the day-to-day operations of the club. The Oilers unveiled their Gretzky statue outside the new Rogers Place on Wednesday. The club has a new Hall of Fame room at the arena, which will serve as the media interview room and a place for press conferences. Gretzky, Mark Messier, Paul Coffey, Jari Kurri, Grant Fuhr, and Glenn Anderson were in attendance for the dedication of the Hall of Fame room on Wednesday. 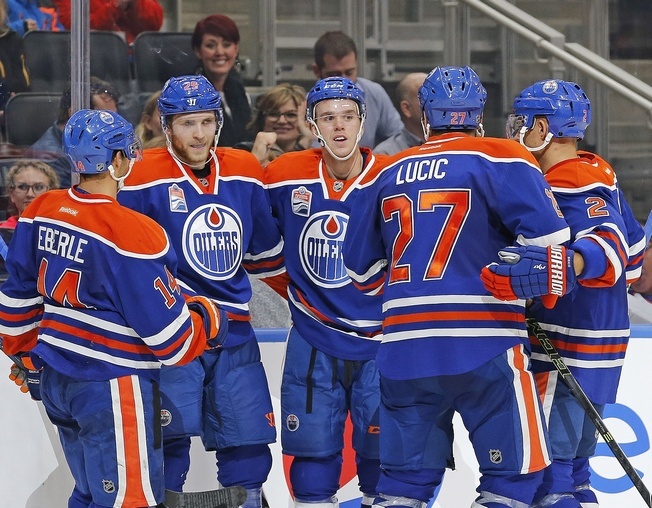 Edmonton is hoping that the team’s shared history will have an impact on the future. The pieces are in place to turn things around and Gretzky’s presence should help in that regard, showcasing a tangible goal that can make a practice impact on the product on the ice at Rogers Place.